VIZ Media announces participation and support for Free Comic Book Day 2018 with a special sampler featuring exclusive excerpts from the two newest Pokemon manga adventures, Pokemon Sun & Moon and Pokemon Horizon: Sun & Moon. Scheduled to take place on Saturday, May 5, 2018 at thousands of locations nationwide, Free Comic Book Day is an annual promotional campaign developed by the North American comic book industry to help bring new readers of all ages and interests into independent comic book stores. Free Comic Book Day (FCBD) began in 2002 and is coordinated by the industry’s single largest distributor, Diamond Comic Distributors. Readers should visit freecomicbookday.com to find local participating retailers in their area. VIZ Media proudly participates this year as a Gold Level Sponsor with this special free Pokemon release (available while supplies last). 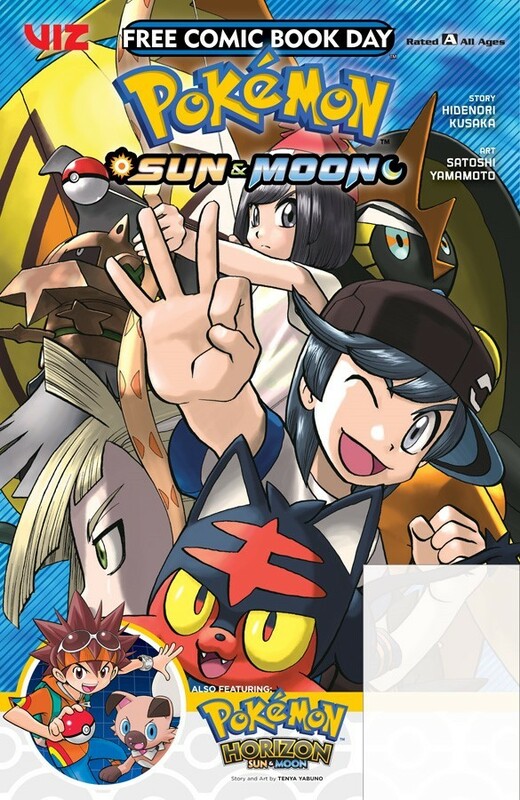 Pokemon Sun & Moon and Pokemon Horizon: Sun & Moon are the latest All Ages manga adventures inspired by the Pokemon Sun & Moon video game. VIZ Media will launch both series in print in Summer 2018. Enjoy chapters from the latest Pokemon manga series, Pokemon Sun & Moon and Pokemon Horizon: Sun & Moon. Both series are rated “A” for All Ages. In Pokemon Sun & Moon, Sun dreams of money and Moon dreams of scientific discoveries. When their paths cross with Team Skull, both their plans go awry. In Pokemon Horizon: Sun & Moon, Akira’s summer vacation in the Alola region heats up when he befriends a Rockruff with a mysterious gemstone. Together, Akira hopes they can achieve his dream of becoming a Pokemon Trainer and learning the amazing Z-Move. But first, Akira needs to pass a test to earn a Trainer Passport. This becomes even more difficult when Rockruff gets kidnapped. Pokemon Sun & Moon Volume 1 will be released exclusively in print on May 8, 2018. Pokemon Horizon: Sun & Moon Volume 1 will be available on July 10, 2018. More information on Pokemon Horizon: Sun & Moon will be released in the near future. Pokemon is one of the most successful international entertainment franchises of all time. More than 290 million Pokemon video games and over 23.6 billion Pokemon Trading Cards have been sold in more than 74 countries in addition to substantial publishing and merchandise sales. VIZ Media is the official North American distributor for a wide variety of Pokemon home media releases including animated series and films and also publishes a variety of Pokemon manga graphic novel series including Pokemon Adventures, Pokemon Adventures: FireRed & LeafGreen, Pokemon Adventures: Emerald, Pokemon Adventures: Diamond and Pearl/Platinum, Pokemon Adventures: HeartGold & SoulSilver, Pokemon Adventures: Black & White, Pokemon X•Y, and Pokemon Omega Ruby • Alpha Sapphire.